Asus, the Taiwanese PC manufacturer, has upgraded its ZenBook Flip S laptop on account of the biggest tech trade show IFA in Europe, which has started form September 01, 2017. The laptops in the Asus ZenBook Flip line will now operate on newest quad-core processors of Intel. Declared this year at Computex 2017, the laptop is slimmer than 12-inch MacBook of Apple and is said to be the thinnest convertible laptop in the world. Having a width of 10.9 mm, the Asus Zenbook Flip S (UX370) has a weight of 1.1 kg and operates on standard operating system—Windows 10. The laptop is fueled by a Intel 8th generation Core i7-7500U CPU. There is also 1 TB of SSD PCIe storage, coupled with a latest cooling system that arrives with a liquid crystal polymer fan. The laptop contains up to 4K NanoEdge multi-touch screen with the support to stylus. It is also well-matched with security feature of Windows Hello. The laptop comes with flip 360-degree display, and sports a ErgoLift 360-degree hinge with a dual action approach that tilts and lifts the keyboard into the ideal position for typing when the screen is opened further than 135 degree. The laptop also comes outfitted with the latest cooling system with a liquid crystal polymer fan impeller, which is just 0.3 mm slim and states to keep the device at ease cool. 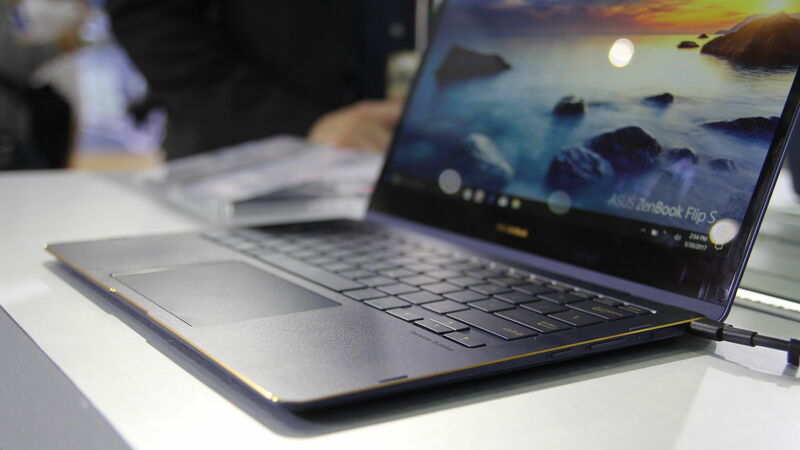 The firm also upgraded its laptops in Zenbook line up with latest processors from Intel. The Taiwanese tech major declared in an event that it will be rolling the ZenBook 13 and the ZenBook 3 Deluxe with 8th-gen Intel Kaby Lake R processors. Apart from these processors, the firm has not yet unveiled any other huge modifications in the 2 devices. The design, screen size, storage capacity, and RAM stay the same as the initial variants. The company has also not unveiled the prices and roll out dates of these updated devices. In addition to this, the computer and smartphone accessories maker also rolled out its ZenBook Flip 14 and ZenBook Flip 15 this week at Berlin on occasion of IFA 2017.